'The Look of Love Still Remains! ABC were one of those groups who come along once a decade to effect a paradigm shift in the way music is heard and made. One of those groups who move the music forward, alerting us to the possibilities of strange combinations, employing radical ideas yet never confusing arrogance with ambition. They kick-started the Eighties with their own brand of pop for the ‘new decade’. Fusing dance floor finesse with a post-punk attitude they released their first single, ‘Tears Are Not Enough’, in the autumn of 1981. More hits followed in rapid succession. ‘ Poison Arrow’, ‘The Look of Love’ and ‘All of my Heart’. On it’s release in May 1982 their debut album ‘The Lexicon of Love’ crashed straight into the album charts at number one. Their second album, ‘Beauty Stab’ was a very different record to the polished beauty of ‘The Lexicon of Love’. It spawned hits the ‘That Was Then But This Is Now’ and ‘SOS’. In 1984 ABC re-routed and headed for the dance floor, releasing ‘How To Be A Zillionaire’. They conquered American audiences with a series of devastating club mixes via ‘How To Be A Millionaire’, ‘Be Near Me’, alongside ‘Vanity Kills’ and ‘Ocean Blue’. By the Summer of 1987 the Worldwide hit ‘When Smokey Sings’ represented a return to luxuriant soul. Likewise the songs ‘The Night You Murdered Love’ and ‘King Without A Crown’. Their fourth album was co produced by Chic’s Bernard Edwards. Entitled ‘Alphabet City’ it captured the cosmopolitan feel of the moment. In 1991 ABC began work on an ambitious soul pop extravaganza ‘Abracadabra’. They released ‘Love Conquers All’ and the Blackbox mixed ‘Say It’ the following year. 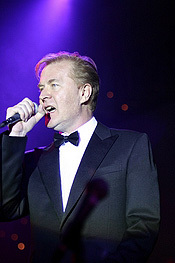 In 1998 ABC performed to over 120,000 people at fifteen UK arena shows with Culture Club and The Human League. The tour was the first of it’s kind since the Eighties and despite a number of other similar tours over the past few years this original line up with ABC proved to be the most successful. To coincide with the tour there was a worldwide release of re-mastered versions of "Lexicon of Love", "How To Be A Zillionaire" and "Alphabet City". Once again Martin Fry and ABC were in the Global Charts. The band continued touring over the next two years and in 2001 joined Robbie Williams to open his show on the European Tour. For ABC it was a huge success, again playing to hundreds of thousands of potential new fans across the UK and Europe. Indeed, The Lexicon Of Love is regarded as the greatest British pop LP of the decade, and remains one of the 10 best of all time. And please also tell me more about your appearances on BBC TV’s ‘Just The Two Of Us’? ”Yeah, that was a disaster! I sang alongside other great singers like Alexander O’Neal, Joselyn Brown and Curtis Stigers, but then I had to do duets with TV a presenter and it was just really hard. It made me realize that my future is in writing songs, rather than dueting." Are you enjoying all this new found TV fame? ”Yeah, it’s nice to be famous in the UK again! When I go to banks now … well, they kind of had a good idea of what I did before, but they definitely know now." 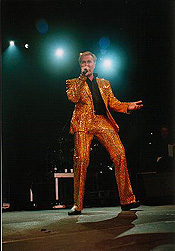 If you would like to win an AUTOGRAPHED copy of one of ABC's CDs, just answer this easy question: In 2005, Martin Fry started the year with a successful 64 date UK tour with Tony Hadley. Following the tour he went straight into the studio to start work on a new ABC album with which former ABC band member? !